The study, written for the University of Calgary's School of Public Policy, says that — contrary to the assurances offered in the government's defence policy — Ottawa will soon be forced into a series of tough, far-reaching choices about the structure and capabilities of the Canadian military. Using the government's own figures, researcher Alex McColl concluded that the Liberals either will have to pour more money into their defence budget in the mid-2020s or scale back their ambitions by buying a less expensive fighter jet. The reason, according to McColl, is that the bills for both new frigates and new fighters will come due at the same time. "Not only will the CF-18 replacement program have to fight for funding against the general austerity and easy riding nature of Canadians, but it will also be running concurrently with the largest military procurement in Canadian history: the National Shipbuilding Strategy," he wrote. 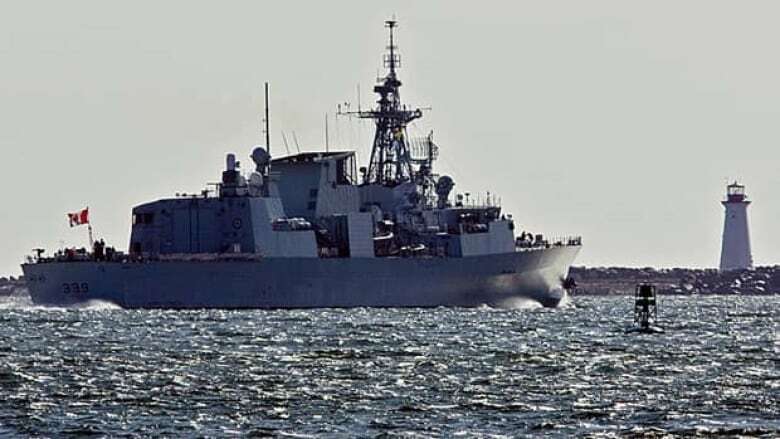 During the 2015 election campaign, Prime Minister Justin Trudeau pledged Canada would not buy the F-35 stealth jet — that it would go with something cheaper and pour the savings into rebuilding the navy. The way the defence policy figures roll out, McColl wrote, suggests the government is on track to do just that. "Absent the political will to provide considerably more than 1.15 per cent of GDP in defence spending," he wrote, "the Canadian Forces can no longer afford to be a modern multipurpose force and should instead move to a Navy centric force structure." The Liberal defence policy, released just over 18 months ago, forecasts that by 2025, annual defence spending will rise to $32.7 billion, or about 1.4 per cent of GDP. However, the projections in the defence policy do not go past the fiscal year 2024-25 — something the Parliamentary Budget Office flagged in a report in November 2017. That PBO report also raised concerns about whether the Liberals would even meet their procurement targets and predicted the numbers would fall off a cliff before the 20-year defence spending policy reaches its halfway mark. "Measured as a share of the economy, the new spending plan will raise the defence budget by over 17 per cent to about 1.1 percentage points of GDP by 2024," the PBO analysis said. "Following this, spending will decline by 38 per cent to 0.69 percentage points of GDP by 2035." McColl said Canada may be left with no choice but to buy a cheaper fighter. "The best value solution to the CF-18 replacement is the least expensive jet in the competition: the Saab Gripen," he wrote in his report. 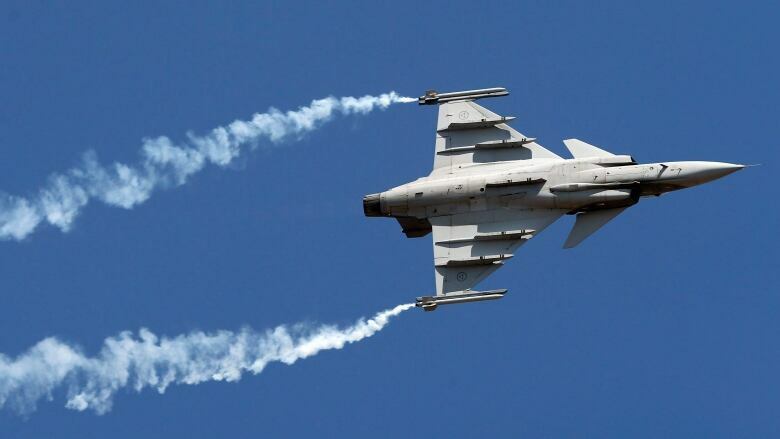 In an interview CBC News, McColl said he chose the Gripen because it is "the dramatically least expensive option," although the Super Hornet is also a cheaper alternative. "I wouldn't say we would be forced (to buy them)," he said. "What I would say is that buying an inexpensive fighter that meets the minimum requirements of what we use the CF-18 for today would be the optimal policy." 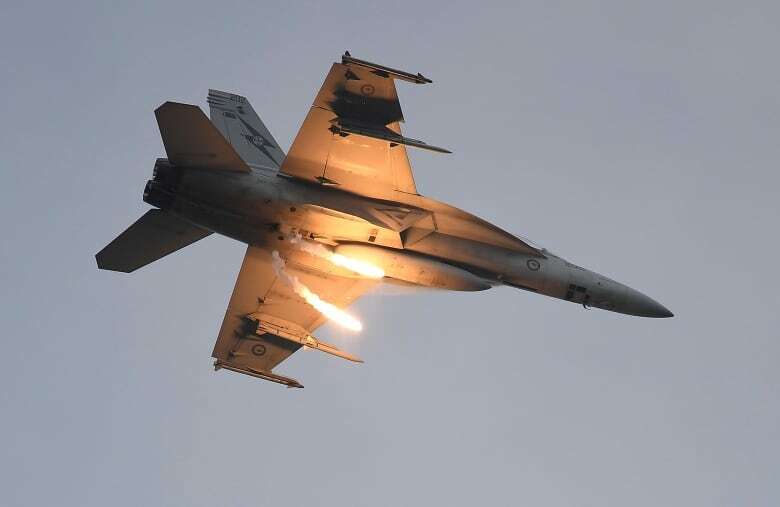 National Defence announced last week it had concluded a deal with Australia to buy 18 used F-18 fighters to bolster the current CF-18 fleet until a brand-new replacement is selected. That competition to replace the CF-18s with new aircraft is slated to kick off this spring, when the federal government puts a tender on the street. A contract award is not expected until 2022. The first new fighters won't arrive until 2025 — and it will be another year after that before they are operational. Dave Perry, a procurement expert at the Canadian Global Affairs Institute, said that new accounting rules — which allow National Defence to spread the cost of weapons system over their lifetime, instead of accounting for them all at once — give the Liberal government a bit of flexibility. But he also pointed out that, by trying to rebuild the navy and the air force at the same time, the Liberals are trying to do something rarely accomplished outside of a wartime setting. "Between new fighters and surface combatants [frigates], those are by far the two biggest projects that have gotten underway in this country in a long time, and doing them at the same time is not something we've done in peacetime before," said Perry. "Previously, we've done these things in sequential order." The question of whether the federal government is organizationally and fiscally prepared to start paying big defence bills is open to debate, he added. Almost four years ago, Perry co-wrote a seminal report that noted the number of staff dedicated to defence procurement at National Defence had never recovered from the budget cuts of the mid-1990s — dropping to 4,300 positions from 9,000. In the time since his report was released, Perry said, there's been progress at the Department of National Defence in hiring procurement specialists and getting systems in place, but he's not certain the rest of the federal government is prepared. "I think the biggest shortcoming is whether the Government of Canada writ large has the capacity, across government, not just in defence, to manage files this size with that level of complexity," he said.